Flat mites* (Acari: Trombidiformes: Tetranychoidea: Tenuipalpidae) range from 0.25 to 0.4 mm in size, with a diversity of body shapes from round, elongate, pyriform, ovoid, triangular in cross-section with either a flat venter or flat dorsum, to paper-thin. The group varies a great deal in color also, with variations on red being the most common; however the discovery of many new species from Asia, Africa and Australia has revealed much more diversity in color variation from yellow, orange, green, to brown. The world fauna has been variously treated on several occasions (Pritchard & Baker 1951, 1958; Mitrofanov 1973a, 1973b; Meyer 1979; Mesa et al. 2009 – see reference page for details), but the information available lacks resolution. For example, the three most important species in the family world-wide, Brevipalpus californicus, B. obovatus and B. phoenicis are still consistently confused and misidentified. The genus Brevipalpus is the most commonly intercepted genus of Tenuipalpidae in quarantine world-wide, but it is also the most complicated and by far the most diverse genus in the family. * also referred to as false spider mites, in reference to the related family of spider mites, Tetranychidae. The family Tenuipalpidae has a worldwide distribution with over 1100 valid species belonging to 38 genera. 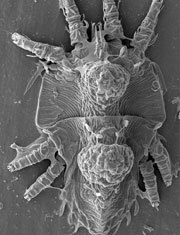 Most species have been described from North America (33% of the total known flat mite fauna) and Africa (13%), whereas little is known about flat mites in the rest of the world (Mesa et al. 2009). Although the USA is currently free from many serious mite pests and mite-borne diseases that are present throughout the world, we must be prepared for the consequences of continued everyday international movement of people and goods. The identification methods and diagnostic information currently available do not allow accurate and reliable identification for the majority of economically significant mite species. Flat mites remain one of the most economically significant of all acarine groups. All species are phytophagous and the species that have been identified as pests have shown the potential to cause severe economic damage to agricultural crops, ornamentals, and timber (Baker & Tuttle 1987, Ochoa & Salas 1989, Evans et al. 1993, Childers et al. 2003b). They cause damage directly through feeding on host plant tissue and indirectly through the transmission of plant viruses. Through direct feeding, flat mites can cause severe damage to the leaves and fruit of their host, and in some cases to the bark and roots. Some species are associated with the formation of galls, while others extensively burrow into the cambium. Flat mite species in the genus Raoiella were recently discovered, by the authors, to feed via the stomata on their host’s leaves, adding another dimension to the ecology of the family. Some species in the genus Brevipalpus are associated with more than 15 different plant viruses of commercial fruit trees and ornamentals in the Americas. For example, the damage by the citrus leprosis virus carried by Brevipalpus phoenicis sensu lato costs hundreds of millions of dollars in the Americas every year (Childers et al. 2003). Mesa et al. (2009) lists the number of flat mite species described from the Nearctic region as 138 species in 6 genera, and according to Baker & Yin (1988) over 250 species have been reported in the USA. This means that a significant number of exotic species are present, or have been reported, in the USA to date. Despite their economic importance, flat mites remain poorly understood world-wide. This is due mainly to a lack of collecting globally and unfortunately to poor taxonomy. With most geographic regions remaining significantly under-collected, little can be concluded about species distributions and invasiveness, nor about the relationships within the group. The current geographic patterns reflect more the distribution of active acarologists than they do actual species richness. We can say for sure that based on the number of interceptions from 1990 to 2011, the number of flat mites entering the USA is on the rise, and these interceptions are closely associated with the increase in trade of ornamentals, fruits, and other crops world-wide. Brevipalpus is a new world group with most diversity occurring in the Neotropical region, followed by the Nearctic region. Raoiella is a mainly Austral-Asian group. Tenuipalpus appears to be a mostly old world group with most diversity occurring in the African region, followed by the Oriental and Neotropical regions. Aegyptobia is most diverse in the Nearctic region, followed closely by the Western Palearctic region. Cenopalpus is most diverse in the Western Paleartic region, with most of the species known from Mediterranean countries.